Number of Chinese companies on Fortune Global Top 500 approaches that of the U.S.
Fortune released its latest Global Top 500 last week, and 120 Chinese companies – including those from Hong Kong and Taiwan – made the list, closing in with the number of U.S. companies, which leads with 126. The number of Global Top 500 companies from China is far ahead of those from Japan, which ranks 3rd with 52. The increase in the number of Chinese companies, which has been growing for 15 years, is one of the fastest from any country since 1995, and the improvement in ranking reflects the fast growth of the Chinese economy. China could overtake the U.S. in 2019. ased on annual revenue, State Grid Corp, Sinopec and China National Petroleum Corp made the top 10, occupying the 2nd, 3rd and 4th spot, with revenue of USD348.9 billion, USD326.9 billion and USD326 billion, respectively. Feng Liguo, Research Fellow at China Minsheng Bank’s research center, said that while some Chinese firms are making gains in terms of innovation and diversification, there is still a long way to go before Chinese companies can truly be called great companies. Many of the Chinese companies are still profiting based on material prices and China’s financial sector is posting better results than the manufacturing and services sectors,” Feng said, noting that the pattern reflects China’s developmental stage within the industrial period, in contrast to the U.S. post-industrial state. By sector, Chinese companies are concentrated in heavy and chemical industries, real estate, engineering and the metals sectors. In contrast, many Top 500 companies from the U.S. and Japan come from the internet, healthcare and food industries. State-owned firms still account for two-thirds of Chinese companies on the list. In terms of profitability, four Chinese state-owned banks, including the Industrial and Commercial Bank of China (ICBC) and China Construction Bank (CCB), are among the top 10. Among the 12 Chinese companies in the most profitable 50 list, only Ping An Insurance, Tencent, and Alibaba are not state-owned companies. Thirteen Chinese companies made their debut on the list, including China Merchants Group, mining company Yankuang Group and home appliance giant Haier. China conglomerate HNA, Anbang Insurance and Wanda Group, which were previously on the list, fell out as their revenue shrank, the South China Morning Post reports. China’s private companies and tech giants are quickly moving up the list. JD.com ranks at 181, up 80 places from 261 in 2017, Tencent Holdings has moved up 147 places, from 478 to 331 this year, while Alibaba Group Holding rose from 462 last year to 300 this year. “We will see more innovative and high-tech Chinese companies join the list, against the backdrop of China’s rapid developments in artificial intelligence (AI), internet of things (IoT) and big data,” said Tiger Shan, Partner at Strategy&, PricewaterhouseCoopers’ strategy consulting business. 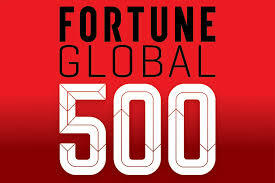 The Fortune Global Top 500 is available here.